Back to Home/Main Menu Back to Class Description Menu Kid's Classes Adult TKD Classes Tai Chi Systema Study Group Too Old? Never! We teach respect, discipline and success! Your child will learn to identify potential danger and to protect themself. At the same time, they will be learning the traditional and effective martial art of Tae Kwon Do. Traditional martial arts teach respect for self and others, and the benefits of setting, working toward and attaining their goals. A recent study found that 641 out of 1000 school children felt they could NOT reach their expected goals, and instead of trying to reach goals, avoided any activity that required work on their part. The ability to reach goals is one of the biggest indicators of success in both children and adults. Other benefits of Tae Kwon Do include increased focus and proper exercise, all of which will result in better grades, better discipline and more respectful behavior. Tae Kwon Do has roots in the ancient hwarangs, and has been modernized over the years, by Japanese desiring to inspire character in their Korean subjects, by the Korean military and finally as an Olympic sport. Competition is another possible aspect of your child's training. Children who for whatever reason are not well matched in team sports, usually do well in martial arts. While competition is not required, we do offer a variety of competition opportunities, from local fun competitions to regional and even national level tournaments, in a variety of "tournament styles." There is something to fit everyone. Character development is something that we not only teach, but model in our lives. How character is taught varies with the age of the student. Character is a benefit of training in any complete martial system, taught by any reputable and conscientious instructor, as without character we are reduced to uncivilized behavior. At Coquille Martial Arts, we consistantly have high expectations for all of our students, working with each student to develop his or her potential to its fullest. We believe that the best "fight" is one that ends without coming to physical blows and without name calling, bullying or other agressive action. To this end we teach our students, how to "not be there." This is not the same as running away. This means your child learns a proven system for standing up to a bully, while not allowing physical or verbal blows to land and while being able to maintain their honor and integrity. These systems have been developed for use by law enforcement professionals over the last two decades, and have been recently modified to be learned by civilians, including your children. With all the benefits of Martial Arts, how can you lose? Our Pre-school TKD classes are for children ages 3-5 year old. 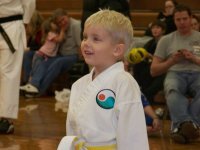 Your child will learn personal safety focusing on stranger avoidance, how to work cooperatively and politely with others, basic martial arts moves, and tumbling for safety are all taught in a traditional structured atmosphere proven to improve discipline and focus, while your child has fun learning. Class is 30 minutes long, one time per week, a perfect length to allow this age group to learn without being overwhelmed. Your child will move from this class to the regular kids' class when they are ready. Beginners (Coquille and Coos Bay) A 45 minute class that acts as a bridge between the pre-school class and colorbelt 7-12 class and with a low student/teacher ratio. This class teaches all the elements of the regular white belt curriculum while the smaller class size allows for time left over for a game or two, and allowing the child to increase his or her attention span in order to increase the discipline and focus required for an hour class. Students as young as 4 are able to take the class if they possess the proper focus and ability to follow directions, otherwise we will ask that they take a few months of the pre school class to prepare. Kids age 7-13(younger or older, depending on the individual): In addition to learning all the traditional aspects of Tae Kwon Do, the kids' classes teach kids to learn how to diffuse the bully and speak up for themselves and others in a polite and acceptable manner, using our copyrighted KidSpeak program. Use of the KidSmart program teaches basic safety and skills for handling a variety of emergencies. Martial arts and especially TKD teaches respect for self, the need for goal setting and goal obtaining. 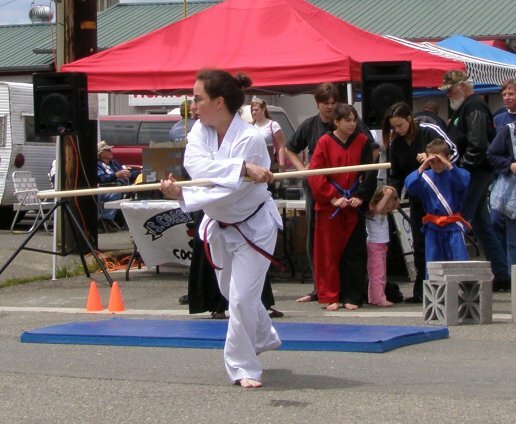 Martial arts promotes fitness and healthy living. Martial arts promotes the development of a person's greatest asset: their mind, while at the same time learning the martial art of Tae Kwon Do. Teen TKD: Teen aged students begin to transition into the adult classes based on their skills, body size and emotional capabilty. This may begin with one adult class a week, or a complete transition, as required for both the teen student, the children in the kids' class and the adults in the adults class. The adult classes teaches real life self defense as part of the traditional TKD curriculum, while maintaining honor and the safety of the participants. Your child will participate in the weapons class when he or she shows an aptitude for learning forms at a faster rate than average. This class offers an extra hour of instruction a week for approved students already enrolled in our Tae Kwon Do curriculum, with in depth work in weapons' forms starting with kama and bo and advancing at the individual pace of each student. For students who wish to take their tournament experience to the next level, we will also incorporate music into the weapons and creative forms we teach.